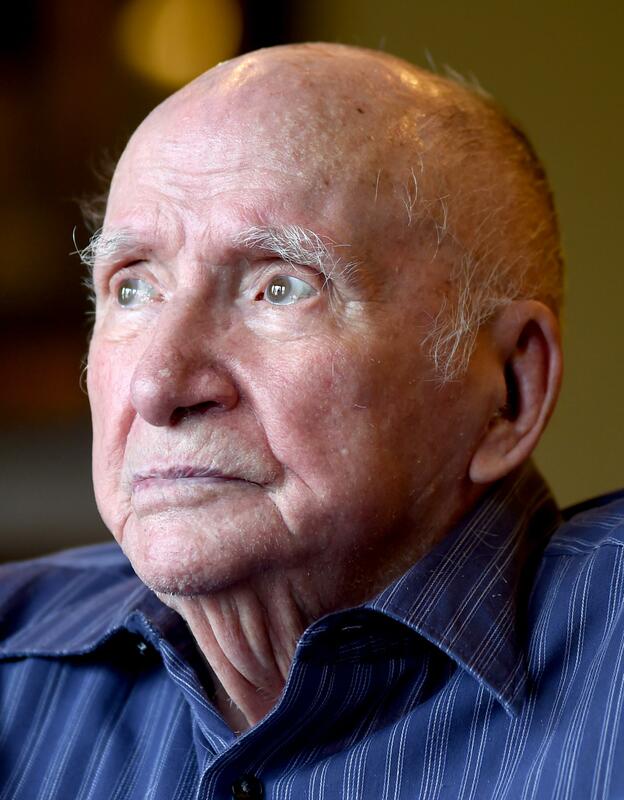 Mon., Sept. 26, 2016, 4:03 p.m.
BILLINGS – Ben Steele’s hold on his sanity as a prisoner of war after surviving the Bataan Death March relied on hidden scraps of paper, stolen pieces of charcoal and his artist’s memory of scenes from his home in Montana. “I used to dream about Montana more than anything else, more than I did food – and I used to dream about food all the time,” Steele once said. “I was awful sick and I thought I was going crazy, so I had to do something to occupy my mind,” he said. Steele, a former art professor, died Sunday in Billings with his wife Shirley and daughters Julie Jorgenson and Rosemarie Steele at his side. He had been in hospice care for more than a year and succumbed to an infection, Julie Jorgenson said. He was 98. During the war, other prisoners saw what he was doing and suggested he draw what he saw around him. He created depictions of life in the camp in charcoal on the floor, and then with pencils and paper that other prisoners smuggled to him. “I kept little scraps of paper, the inside of cigarette packages, that kind of thing,” Steele said in a 2004 interview with the Billings Gazette. His original sketches were lost. After his liberation in 1945 and during his long recovery, he re-created sketches and made paintings depicting the march and his 3 1/2 years as a prisoner of war in the Philippines and Japan. He said the artwork helped him deal with the suffering he endured and the faces of the dead and dying he saw in his mind’s eye. Steele was bayoneted, starved and beaten and suffered dysentery, malaria, pneumonia and septicemia. He lost 80 pounds. Steele became an art professor at Eastern Montana College, which later became Montana State University-Billings. He said he learned to forgive his Japanese captors because of his relationship with Harry Koyama, an art student of Japanese heritage who took courses from him. Steele was born on Nov. 17, 1917, in the small Montana town of Roundup and grew up riding horses, roping cattle and occasionally delivering supplies to western artist Will James. He was a U.S. Army Air Corps private in the Philippines when the Japanese captured his unit in 1942 during World War II. Thousands of soldiers died during the 66-mile march under a scorching tropical sun. Steele’s survival story was chronicled in the 2009 New York Times best-seller “Tears in the Darkness: The Story of the Bataan Death March and Its Aftermath,” by Michael and Elizabeth Norman. An Ohio teenager, Lexi Winkelfoos, traveled to Montana twice to visit Steele after reading the book for a history project when she was a sophomore. “I just wanted to know that he was happy after everything he had been through,” Winkelfoos said during her second visit last year. Steele continued to paint into his late 90s. His powerful sketches and paintings of his time in captivity are housed at the university museum in Missoula. A memorial service is scheduled at 1:30 p.m. Oct. 4 at Montana Pavilion at MetraPark. Published: Sept. 26, 2016, 4:03 p.m.